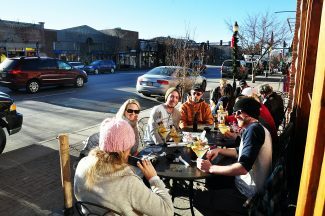 The Baker family sips margaritas outside at Cantina Mexican Restaurant in downtown Steamboat Springs. STEAMBOAT SPRINGS — Steamboat Springs’ oldest downtown bar and restaurant is listed for sale at the same price a plate of huevos rancheros used to cost there back in 1974. The one-dollar price tag for Cantina does come with a few caveats though. Cantina’s new owner would have to arrive with plenty of experience, be ready to navigate a competitive downtown restaurant market and also be willing to negotiate a lease with the property owners. The restaurant faces much more competition in the downtown corridor than it did when it first opened in 1973 as the Steamboat Cantina and Tortilla Company. Several other Mexican restaurants have also popped up nearby in recent years offering new amenities such as rooftop decks. LaRoche, who owned and operated Cantina with his family from 2012 to 2016, is working with real estate agent Chris Paoli and property owners Jeff and Kristi Brown to find a new owner who could step in before Christmas. The business is being advertised as turnkey, meaning it could be opened and profitable without any initial construction or tenant finishings. Prospective business owners should call Chris Paoli at 970-819-1432 for more information. A father and son group out of West Virginia took over ownership from the LaRoches in 2016 and operated the business until it closed recently for the shoulder season. LaRoche, who left Cantina to focus on growing E3 Chophouse on Yampa Street, said the dollar price tag for the business has already sparked a lot of interest. LaRoche noted Cantina’s rich history, saying for many years it was THE place to hang out in town and grab a drink after skiing at Howelsen Hill. He hopes a new owner can update the restaurant while still respecting the restaurant’s rich history. “It’s still got that stigma that people still enjoy,” LaRoche said. Steamboat Pilot articles from the 1970s note how popular and successful the business had gotten since it replaced der Steinkeller, a popular 3.2 bar. 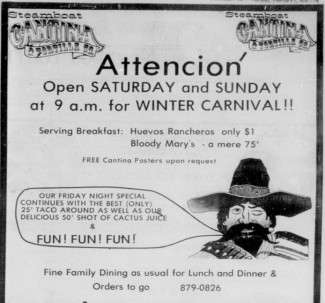 Winter Carnival attendees could get a bloody mary at Cantina for a ‘mere 75 cents,’ and tacos were sold for a quarter on Friday nights along with 50-cent shots of cactus juice. “You do get a lot for your money there, although the beans and rice aren’t always the tastiest, the restaurant improves with each passing week,” the Pilot reported in 1974.